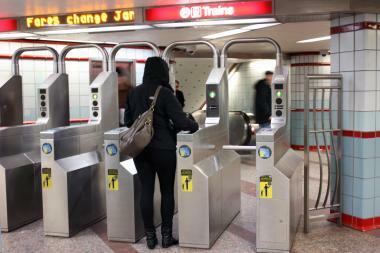 Most CTA riders who use passes will see their fares go up Monday. CHICAGO — Rate increases on all CTA passes, except for those for students, went into effect Monday. Aside from the base fare of $2 for each bus ride and $2.25 for every train ride, every other fare will change. The fare for a 30-day pass rose from $86 to $100. Those who purchase single-day passes will pay $10 per pass compared with $5.75. The cost of a three-day pass rises $6 to $20, and a seven-day pass now costs $28, a $5 increase. A combined CTA/Pace pass has also increased $5, to $33. The fare changes are the agency's first since 2009 and were approved in December to increase the agency's revenues. CTA spokeswoman Tammy Chase said the agency's customer service department is prepared to field a surge of calls Monday. "We've had big changes before, and we know how to handle this," Chase said. Any passes purchased before Monday will continue to work until the expiration date printed on the back of the pass. Anyone using a pay-per-ride fare card will have to pay $5 to board a Blue Line train from O'Hare Airport. The fare will remain at $2.25 for anyone using a Chicago Card and Chicago Card Plus for at least six months. Anyone using a pass will not have to pay the premium. The only fare decrease comes for elementary and high school students, who will pay 75 cents, or a dime less, per ride during school days.